This is an article that was featured as a guest post on SheGeeks as part of the She Geeks in Tech Week in June 2008. A recent case study that I undertook as part of my social media research project, provided evidence to back up the suggestion that resistance to change is by no means confined to employees within business organisations. Although much of the literature related to change and the successful management thereof, is primarily focused upon organisational change, many of the lessons and implications can be equally well applied to changes in all aspects of life including that of online communication. The case study examined in detail the issues faced by members of an online community when attempting to move from Web 1.0 forums where they were comfortable and were used to posting in one single forum thread, to a Web 2.0 online social network offering a much wider range of facilities, but also what appeared to many members to be a bewildering array of choices that they found confusing and threatening. Because change can be rewarding for some people and an unpleasant experience for others, perceptions can differ greatly, depending on your standpoint. Those who propose change not unnaturally tend to view it in positive terms, but in most cases these are people leading a group, community or organisation who are likely to either remain relatively untouched by the change or to actually benefit from it. Those lower down often see matters in a different light, particularly if they think that those who advocate the change will not be affected. 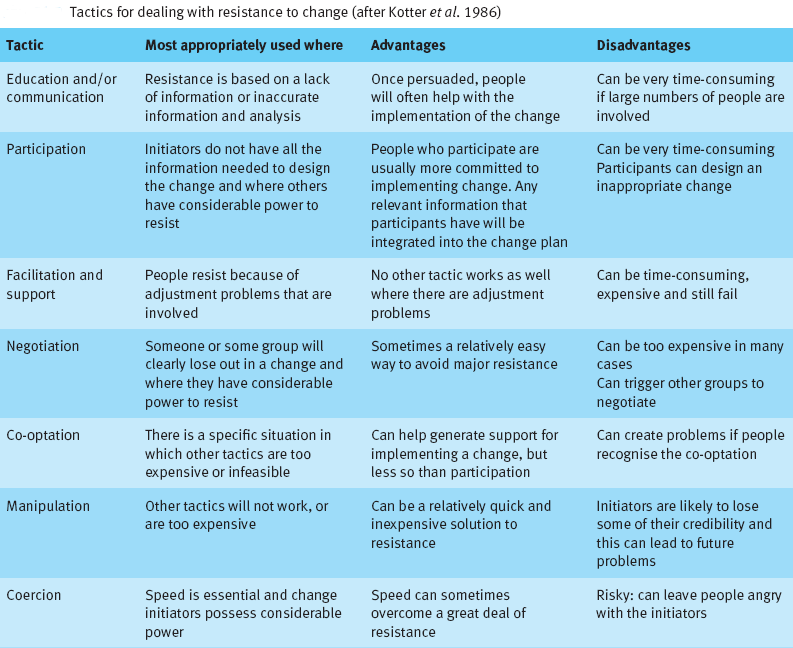 For these reasons there is a widespread assumption that resistance to change is inevitable, and this has led to a strong interest in studying this phenomenon in the change process. In the case study, the proposer of the change thought that the extra features available in online networks would considerably enhance the community and therefore viewed the change as a predominantly positive and exciting experience. Unfortunately, the members who had not been sufficiently prepared for the degree of change that they were about to undertake did not share this sense of excitement and were more inclined to dwell upon the negative aspects. Parochial self-interest: People have often invested a great deal of time, energy and commitment into a project and this is a ’sunk cost’ that cannot be recovered unless things stay the same. This creates a force for maintaining the status quo and engenders a degree of resistance. Members of the group in the study had already registered with two online forums, had become conversant with the software and were stuck in a fairly comfortable rut. 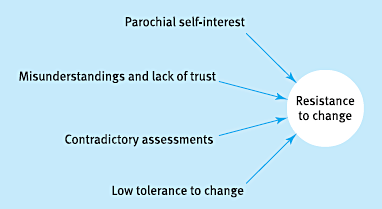 Misunderstandings and Lack of Trust: The less a person knows about the reasons for change and how it will impact upon them, the more likely it is that they will resist the change and if there is an inherent suspicion about the proposer of change and their motivation, this will result in selective perceptions about the proposal. Some members were wholeheartedly behind the move away from the old forum and were more likely to try to get to grips with the new platform but others who saw less need to move found the new surroundings irritatingly complicated. Contradictory Assessments of The Change: People differ in their personal assessments of the costs and benefits of a change. The proposer tends to see only the positive outcomes and often forgets that what they perceive to be a benefit, others may see as a threat. If this happens, evidence suggests that there will continue to be resistance to changes long after their initial implementation. Low Tolerance to Change: There are often wide variations in the capacity of people to absorb change. To some extent this depends on their ability to tolerate ambiguity and to those persons with a low tolerance, changes with unknown consequences can be highly threatening. It is so widely assumed that resistance is inevitable that successfully overcoming resistance to change is taken as being an outcome in itself. However, because resistance can occur for such a wide range of reasons, it is doubtful if there is a single method that can deal with them all. Thus, a contingency approach, in which the method used is centred on the reason for resistance, is likely to be more appropriate. The most immediately obvious method to employ in an online situation would appear to be that of education and communication. It is of crucial importance to educate members of the original community about the positive benefits that will ensue from the change. People generally fear what they do not understand and this is nowhere more apparent than in resistance to new technology. During the 1990s, many older employees strenuously resisted the introduction of computers into the workplace because they were not familiar with them, did not understand them and did not consider themselves to be sufficiently technically knowledgeable to be able to operate them. Gradually, over time and with sufficient employee training sessions, they came to be accepted as the norm and it is now extremely rare, if not impossible, to find a workplace that doesn’t use computers in some form or another. As has been discussed in previous articles on this blog, people became quite comfortable using the web for shopping and socialising in places such as MSN Communities, Yahoo Groups and various online forums. MSN and Yahoo allowed a degree of autonomy to the community owner to create custom pages, change some colours and so on, but very little freedom was afforded to the ordinary member/user. Large public forums (such as those provided on the Digital Spy website in the UK for example), were constrained by high hosting and bandwidth costs, so users were not allowed any personalising at all and simply joined and posted messages. Some people branched out and hosted their own private forums which enabled them to be more creative by installing themes and allowing users to display avatars and perhaps upload images. Again, hosting and bandwidth costs were always a factor for the webmaster to consider and the ordinary member was still quite restrained in what they could do on these forums and websites. Therefore, the vast majority of forum and community users in the Web 1.0 era were not given many opportunities to express themselves creatively, but equally, not much was expected of them either. Once one had mastered the rudiments of joining and posting in a forum or community there was nothing more to learn and no major changes took place for some time allowing these users to settle into a comfortable, if fairly boring routine. At the same time, webmasters became used to managing their own websites with no user input and enjoyed total autonomy over their small patch of the web. Suddenly, along came Web 2.0 with all this talk of ‘user generated content’, ‘taking back control of the web’ and ‘online social networking’. Kanter et al. identified three different roles in the change process – change strategists or initiators who initiate and set the direction of change, change implementers who are responsible for the co-ordination and implementation of the change and change recipients who are strongly affected by the change and its implementation. The Web 2.0 evangelists and creators of the social software are change strategists who are striding forth enthusiastically, embracing the new media and getting involved in all aspects – blogs, wikis, social bookmarking, social networks, Twitter, Friendfeed and so on. These are the early adopters who are always in the vanguard of anything new, because such people embrace change, seeing it as a challenge and an opportunity. Change implementers are people rather like myself perhaps, who, whilst not totally at the forefront of change and could not be classified as pioneers in that sense, are always on the lookout for something new and stimulating to try out and are keen to encourage others to come along and experiment with them. This usually involves some form of evangelism and persuasion and a degree of organisation during the implementation phase. The majority of web users however, fall into the third category of change recipients and the measure of how successful change is for them is highly dependant on the skills and abilities of the change implementers. Returning to Kotter et al’s tactics for dealing with change; participation is another measure that may be used successfully to facilitate the change to Web 2.0. If change implementers can involve the recipients in the change process – in effect getting them to take ‘ownership of the changes’, this will considerably reduce dissatisfaction and resentment at having to make the changes at all and allow for more enthusiasm and excitement to surface. Facilitation and support tend to go hand in hand with this approach because the change implementers are also guiding and helping the users along the way. The social web is not an employer and thus more stringent tactics are not really appropriate because if all other efforts fail, such persons must simply be left behind on the Web 1.0 platforms. One other area that doesn’t necessarily always apply in an organisational setting, but most certainly does in the context of the social web, is that of freedom and choice. As explained above, most of the Web 1.0 platforms offered little of either which although restrictive, can also afford security and a type of ‘comfort zone’. 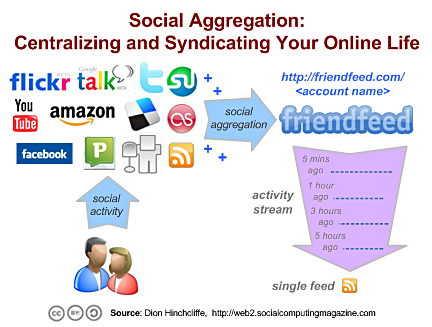 The Web 2.0 social media abounds with freedom and choice for the user and this can initially be somewhat bewildering and even disconcerting. Users don’t always know what to do with such a choice of rich media and will either run towards it and begin filling their pages with every last bit of media content imaginable because no one is stopping them, or run away in fear back to the security of the plain old forums that they know and understand. It is at this point that facilitators and enablers are needed to give some guidance on the new media and how to use it sensibly and get the best out of it. Perhaps unfortunately in terms of style and good taste, because the social networks are still so very new in real terms, many users are still in the ‘child in a sweetshop’ phase and have discovered the large networks like myspace which afford them the opportunity to express their creativity in a very loud and discordant way with large graphics, flashing images, music, videos and much else besides all jostling for space on one very crowded page. Nonetheless, at least such users have successfully made the change from Web 1.0 to Web 2.0 and no doubt good taste will eventually return, once the novelty has worn off. Kurt Lewin developed both a method of analysis of whether change is appropriate and a method of handling change if it is decided that it is. • by changing the direction of a force so that a restraint becomes a push factor. If it is felt that change is desirable, then a three step process would be initiated. Unfreeze: The aim here is to establish a motive for change which is done by destabilising the status quo and freeing up attitudes to change. The advantages of the new system (social networks) are extolled at the same time as the disadvantages of the current system (forums) are emphasised. 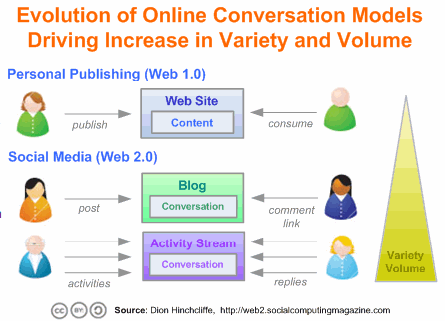 Move: The change from the old ways (Web 1.0) to the new (Web 2.0) takes place. Refreeze: The new behaviour is consolidated or refrozen as the new norm, thus discouraging regression to the old methods. Peer pressure can be a very powerful method of reinforcement, so that if most of the members of the old group have settled into the new surroundings quite happily, the more recalcitrant members will then do the same, albeit more slowly and reluctantly. The tricky part is trying to prevent the group leaders from regressing (going back to the old forums) because the others are very likely to follow out of a sense of loyalty or solidarity. This entry was posted in research and tagged business, change agent, change management, communicate, communication, communities, computers, corporate, cultures, dissatisfaction, early adopters, education, facilitator, forums, freedom, graphics, groups, images, msn, music, myspace, people, persuasion, research, skills, social media, social networks, software, study, support, technology, themes, theorist, user generated content, videos, webmaster, websites, yahoo on 21/06/2008 by TBCP Admin. This entry was posted in research and tagged article, bandwidth, blogs, bookmarking, bookmarklet, bookmarks, browser, categorising, classification, clips, collaborative, communication, communities, content, cultures, database, del.icio.us, discussion, dissertation, diverse, exploring, facebook, feeds, flickr, folksonomy, friendfeed, friends, global village, google, international, internet, links, messaging, mybloglog, myspace, network, news, online, ownership, popular, referencing, research, rss, search, social, social media, social networking, social networks, social software, statistics, tagging, taxonomy, tracking, Twitter Lists to follow, video, web, websites, yahoo, youtube on 02/06/2008 by TBCP Admin.